Time: 9.15 a.m. – 5 p.m. There might well be a few places available for this course. It’s very likely we can assist with transport from Cowes to Carisbrooke (and back!) on the day. 9.30 – 9.45 Arrival at Carisbrooke Church Hall next to Village Car Park for Registration, tea or coffee. Lunch – sandwiches and soup provided in hall. Presenter for this course: Roger Booth of the Association of Ringing Teachers. The Isle of Wight Bell Ringers will be involved in a Isle of Wight Bereavement Services Open Day, includes Ringing Remembers Project and Remembering the five Island Bell Ringers killed in WW1. – help folk with their bereavement journey. Proceeds will be donated to the Isle of Wight hospice. Owing to most Island ringers volunteering to man the gates for the Chale Show over the weekend of 4th and 5th August there will be no ringing at All Saints, Ryde, during this weekend. If you are visiting over that weekend and would like to ring at one of our towers please ensure you check with tower secretaries or tower captains beforehand as this will also apply to a lot of our towers. Because a lot of ringers are busy or on holiday the decision has been taken to cancel this Monday’s (30th July) practice at the Minster at Newport as it is felt there will be not enough ringers to make a viable practice evening. Normal practice will take place next week (6th August). On Sunday Ryde tower helped ringer Maureen Kelly celebrate her 80th birthday, and on Swithen’s Day with not a drop of rain in sight! 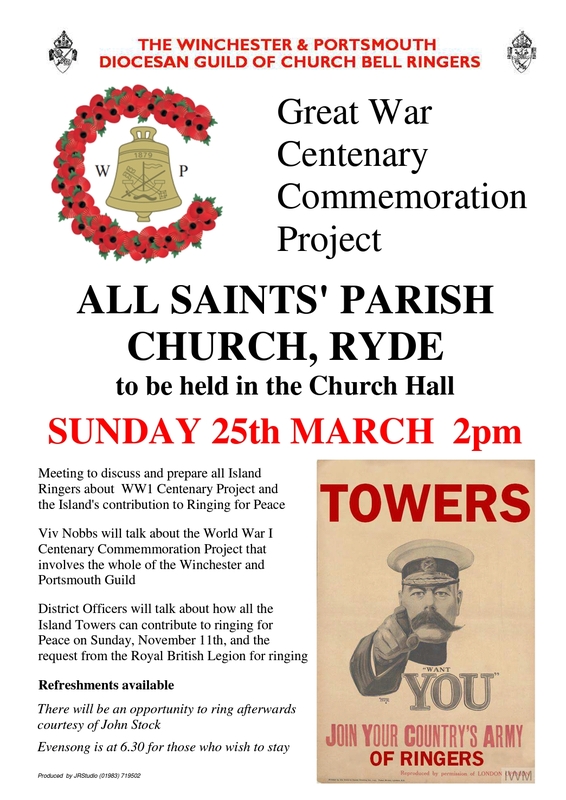 With a lot of organising, secret meetings, ‘coffee meetings’ and underhand communications we pulled off a very special afternoon with nearly all the ringers of the Isle of Wight attending Ryde church hall to help celebrate this milestone event. Maureen admitted to being a ‘bit nervous’ as to how the day would play out, knowing me she had every reason to be so! In the event, on such a hot day, and with a hall full of friends, everything went to plan and I think the afternoon tea, organised and laid out by the Parish Church tea team, was a superb ending to all the hours of organising. An Island band was raised to ring Grandsire Triples for Evensong service in celebration but unfortunately at the half way stage the rope slipped on the 7th and the quarter was abandoned. Remaining ringers did however ring a long touch of Stedman Doubles for the service, something not often achieved at Ryde. Maureen has asked me to pass on her thanks to all of you that attended and to also thank you for the good wishes, together with the many cards and gifts she has received. This morning, Maureen sent me this message: I was on a high and didn’t get to bed until this morning, and up again at 5ish, to open the cards I received yesterday afternoon. I’d call that a success then wouldn’t you! A true Jamboree…ringers, visitors and NHS Ambassadors! I’m sure all ringers wish to thank NHS on the Island for asking us to join their 70th Anniversary fun in this way and to work alongside them for several months for our mutual benefit and enjoyment. The aim was 15 towers out of 15 ringing and it was achieved with much team effort. Island ringers turned up trumps, as ever! Thank you all. It was wonderful and so very special indeed to take part in such a splendid celebration….a great opportunity to meet up with ringing friends from the local area and beyond. Five were on holiday and joined the merry throng and four came out of retirement “For the day” to help the Roving Ringers who were helping to ensure all towers were able to participate. A busy time of year and not all local ringers were available, of course. We wonder if those returning to ring just for the occasion will have enjoyed it so much that…..well, who knows?! Our churches’ visitors went off with Ringing Remembers recruitment leaflets, distributed by the NHS Ambassadors, our partners for the event. One visitor and one NHS lad were former ringers we discovered (one a peal ringer) …we’ll all be in touch again, for sure! The majority of participating towers were visited by NHS ambassadors and they presented certificates of participation to towers and the ringers. The remaining ones will be presented with their certificates in the next week. It was a hot, long and very busy day so the tea and cakes kindly set up ready for us by the congregation members at Chale, before we joined them for their service, were delicious and very welcome. John Stock reported that when they’d started ringing at Freshwater at 5 p.m. several folk entered the church to thank them excitedly for ringing for England’s football victory! Yes, it was indeed a superb result for us all! All Saints’ Ryde ringer and W. and P. Guild P.R.O. We started our day ringing on the three bells at Swanmore. We had approximately 15 ringers ranging from learners to experienced and of all ages. Rounds were rung in the 45 minutes with a little plain hunt at the end. Our NHS representative, Sarah Kearney, respiratory clinical nurse specialist had a go. She stayed the whole time and thanked us very much. Brading next! Ringing on all 8 with again about 15 ringers. Unfortunately, Jay Nevett, healthcare assistant was unable to attend due to family matters. Rounds and call changes were rung in the 45 minutes. Time for lunch… At St Saviour’s on the cliff in Shanklin. Jan Hookey set up a tea and biscuits station. Yummy! All 8 bells were rung… Again, rounds and call changes. Andy Hollebon, Head of Communication made a small speech thanking us all very much, not only for ringing today but also for our WW1 ringing efforts. He apologised for not everyone having certificates but didn’t realise there were going to be so many of us ringing! He assured that more would be sent through. A little bird had told us that Andy had dabbled with ringing in the past and he was offered an opportunity to ring again. Let’s hope he takes it up again in the future! A fantastic day was had by all and it was great to see six young ringers joining us! Edwin Cole, tower captain at Chale, has informed us there will be no ringing practice this coming Thursday, 5th July. I understand the Wight Mouse will still be open if you miss this and turn up but still fancy an afternoon sitting in their garden overlooking the coastline to Freshwater with a nice cooling drink in your hand! Sounds like a plan to me! Because most of the tower ringers at Ryde haven’t compared their notebooks it has been decided to cancel the practice on Tuesday, 19th June. So many of us will be away whooping it up ‘abroad’ we felt it was the best option on this occasion so if you are visiting our Island apologies for upsetting your plans. Please note that because most Ryde ringers are busy this weekend I have taken the decision to cancel ringing for all services this Sunday (3rd June). Apologies if you are visiting and were hoping to join us. We will, however, be practicing come whatever on Tuesday evening. Members of the Middlesex County Association & London Diocesan Guild have been visiting the Island over the Bank Holiday weekend and together with visiting most of our towers took on the task of ringing a full peal at All Saint’s, Ryde, on Sunday, in what must have been the hottest day this year so far. However, the peal was scored in three hours and four minutes so congratulations to all the team who took part and our district hope the party enjoyed the lovely weather and hospitality that our Island has to offer. Rung as part of Twickenham (and friends) ringing weekend on the Isle of Wight. The practice on Monday, 28th May, won’t take place this week at Newport as it’s the Bank Holiday and you should all be out enjoying the weather! Isle of Wight ringers have been remembering those known to have been killed as a result of the Great War and significant battles of that conflict since the centenary of the outbreak of the war on 4th August, 2014. Since 2014 Brading in particular have taken on the task of attempting to ring a quarter peal commemorating the centenary of a death for all the 34 names recorded on the town’s War Memorial after diligently researching the War Records for dates of death. Some of those having been recorded here and on other War Memorials Islandwide, today have relatives alive who are current ringers, so it is poignant that the link with the past still continues and we, as current ringers, have the privilege of being able to honour these men with fitting tributes with the skill we have been given as ringers. Chale are currently also tolling a bell 100 times when a known centenary of death of a member of the Parish on their War Memorial sees its anniversary. Several names are recorded as a block for some chimes as the anniversary of their death has now passed. I know other Island towers, a lot of soldiers and civilians of whom we do not know their dates of passing, are also being remembered during this time with quarter peals and other tributes of remembrance. On the Island we know of five ringing soldiers killed, these were specifically remembered on Saturday during the fundraising event for the World War I Project, details of which are recorded elsewhere, and these are recorded as follows. Frederick James Chiverton who we know was a Watch and Clock Repairer and had lived in Carisbrooke Road, Newport. He served in the 2nd Battalion of the Hampshire Regiment and was killed in action in France on 20th November 1917 aged 34 years. Alfred James Hale, who was a son of the late Frank ( previously Police Superintendent of Newport) and Annie Hale of Newport. Alfred was serving in the Canadian Militia and died on 29th June 1915 aged 26 years. William John Curtis Millgate, who was born in Shalfleet in 1888. and lived in Castle Road, Newport. He served in the Royal Engineers, as a Sapper with a trade of Carpenter, in Hong Kong. He died on 2nd September 1918, aged 29 years. He is buried in Freetown, Sierra Leone. At Godshill, Mr. F. Dennis was remembered. Cyril George Petchey was honoured at Whitwell. Cyril was born in Whitwell and was the son of Mr and Mrs J Petchey who lived at The Schoolhouse. His father was a Schoolmaster. Cyril was an Ironmonger’s Assistant at Mr. Scott’s stores . Cyril married Annie in Niton and they had a child born in 1915 named Joan Maud. They lived at Newport Road, Niton. He served in the Hampshire Regiment and died of his wounds 11th May 1918 aged 29 years. Whitwell bell ringers will be ringing in memory of Cyril again on Friday, this being the centenary of his passing. All these brave men, and many more of whom we know nothing, are now being remembered for their sacrifice and illustrating to the present generations that the link with the past, particularly in the close community of the Island, is ever present even to this day. The silhouette used to commemorate these men on Saturday will now travel to the Basingstoke District for them to honour their fallen. My thanks to Viv Nobbs for the details of the Island ringers. 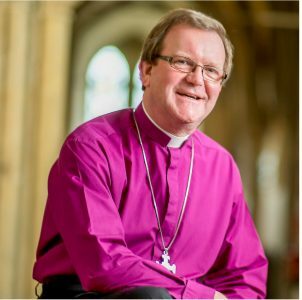 Revd Canon Graham Morris rocked our Parish on Sunday with the news that he and his wife, Angela, have decided to move back to North Island to Cirencester and take up a post which will be closer to his family. Members of the bell ringing team will miss them both deeply and we thank them both and their wider family for the help and encouragement with our ringing in the past six years. We do, however, respect and understand their difficult decision to leave and we wish them well on the new chapter of their lives. I wonder if I add another two bells to our tower could I persuade him to change his mind?! These last few weeks have been filled with emotional highs and lows as Angela and I have faced up to some important challenges, for ourselves, and for our family. The time has come for us, to now accept a new challenge. The Bishop of Tewkesbury has extended an invitation (subject to the usual safeguarding checks being made) for me to become the next Vicar of Cirencester in the Diocese of Gloucester. After nineteen years here on the Is…land, this has been a difficult decision to make, and one that has caused us to reach deep into our hearts for the answer. We believe that God has answered our prayers in enabling us to continue in the work that we both love, i.e. serving a parish: whilst also becoming more easily accessible to our families at a time when their needs are as important as ours. Some of you will be aware of the personal circumstances surrounding my Dad, and of Angela’s decision to go and work for Amy. Returning to the Midlands, means we will be living midway between our parents in Herefordshire, Amy in Winchester and Tim in Portsmouth. Island life has been fabulous and we shall miss it; being your priest for the last 6 years has been a real privilege. It is likely that we shall move at the end of July, and be inducted as Vicar of Cirencester early in September. As we make this leap back across the water, we will of course be praying for you as the search for my successor begins. We hope that you will also pray for us as we embrace this new opportunity. Please note that as the evening practices for both Arreton and Newport, which usually take place on Monday, are on the Bank Holiday (May 7th) this week the decision has been taken to cancel the practices at these towers and you should all be out having fun and enjoying the ‘hot’ weather here on the Island. St Michael and All Angels Church, at Swanmore in Ryde was the tower with some notable firsts on Sunday. The first first was for 16-year-old Jake Saddington who, as a Swanmore-taught ringer, rang his first quarter peal covering on the 6-bell simulator. May congratulations are due to him for all his hard work in getting to this stage at a fairly rapid rate. Kieran Downer clocked up another first with ringing his ‘first’ on the ‘new’ treble. The final first is recording that this is the first ever 6-bell quarter peal recorded for this tower, albeit on a simulator. Well done to all the team at Swanmore for all their enthusiasm and hard work in getting a team up and running. Well deserved congratulations all round. Arreton ringer Gerry Faulkner romped through his first ever quarter peal at St George’s Church, Arreton, on Sunday. Gerry covered for the quarter peal, which was rung ahead of St George’s Day on Monday for the Church’s Patronal Festival, and is the first to be rung there since August 2016, so a very special event by local ringers. After 13 years of being a ringer he was finally persuaded to take the plunge and is another one of our Island band of senior ringers to achieve that. We congratulate him most warmly on the achievement and hope this will be the first of yet more to come! 240 each of St Simon’s, St Martin’s, Plain Bob, Reverse Canterbury. 300 Grandsire. On Tuesday morning (24th April) Haylands Primary School at Swanmore, Ryde, visited St Michael’s Church, for a look to see how bells are rung and were given a tour of the tower. Some 56 year-one children with their teachers were split into four groups and were guided by Tower Captain Lexi Skeldon together with Kieran Downer, Jan Hookey and John Stock on hand to help with ringing and teaching about the church and its working bells. All of the group took a bell to have a go at ringing backstroke, some more successfully than others! An enjoyable morning was had by all with a darkened room required for the helpers to recover afterwards! Following his licensing during the afternoon a quarter peal was rung at Brighstone on Sunday (22nd) to welcome the new rector, Revd Clive Todd and his wife Carolyne. OK, so we have to share him with Shalfleet, Thorley, Calbourne, Newtown, Shorwell, Mottistone & Brook but I’m sure we will all cope! We welcome both to our Island and wish them well for the future. Ryde ringers took to their ropes early on Saturday morning in an attempted quarter peal of Plain Bob Minor to honour the Queen, who has been celebrating her 92nd birthday over the weekend. However, two-thirds of the way through things all started to go horribly wrong and went downhill rapidly thereafter! First the conductor miscalled so we stood and abandoned the attempt and thus after some talk rang a while longer with a touch of Reverse Canterbury being completed. On leaving the tower we were confronted by men from the Gas Board who were evacuating the building because a gas leak had been identified beneath the tower in the boiler room – right beneath where we had been ringing! Work on this continued all day and into the evening and by late evening we were still not sure if the church would be able to be reopened for services and ringing to take place on Sunday. Many of you would have had experienced the noisy evening as the electric storm struck the Island. Photo by kind permission of Ryde resident Jordan Wade. During the course of the worst storm to hit the Island since the early 1980s, over 3,400 lightning strikes were recorded over the Isle of Wight area, with at its peak 93 strikes per minute being recorded island-wide. Ryde tower, locally known as the Gothic Rocket, escaped damage and ringing was allowed this morning with 10 minute’s notice given for the all clear. Workmen are still on site today (Sunday) with a big hole in the Church ground, but for now some sense of normality has returned with normal Sunday services being allowed to take place and performed by our incumbent Revd Canon Graham Morris. We now reflect on events of the past 24 hours and think of how things could have been so very different! Headline photo courtesy of John Stock. St Andrew’s Church, Chale, were also busy this weekend and on Sunday hosted a visiting band of Sunday service ringers from Bishopstoke. Rung by members of the Bishopstoke Sunday service band. Circled tower to peals – 1. The Island ringers were hosts to a group of ringers from the Witney and Woodstock Branch of the Oxford Diocesan Guild for a 3-day tour. The group, led by Michael Probert, arrived on Friday and started with a practice at All Saints’, Ryde. During the course of the fairly reasonable weekend for weather the group managed to ring at all the Island’s towers, and I’m told enjoyed their time over here. The tour concluded with ringing at Ryde again, this time four of their group joined four of the Ryde band in a quarter peal of Single Oxford Bob Triples. The successful ring was the first in this method for all the visitors, and I must admit they were feeling quite chuffed with the ring as they left the tower to catch the ferry home. For Evensong and to Celebrate the Centenary of The Lions Club and 30th Anniversary of the Lady Lions. First in method: 2, 3, 5, 6; visiting ringers from Witney & Woodstock Branch of the Oxford Diocesan Guild. Practice night at Carisbrooke for this Friday, 20th April, has been cancelled this week only, please note! Brighstone hosted the 8-Bell Striking Competition in memory of Don Exell on Saturday, 14th April. This is the first time the tower have been able to host an 8-bell event with the addition of the two extra bells being inaugurated last year. Six teams entered the first Island competition of the year for a lovely afternoon of ringing and socialising amongst Island ringers. Paul Miller acted as judge and Margaret Downer, Isle of Wight District Deputy Ringing Master, thanked him for standing in at short notice. Teams entered in the following order: 1, Brighstone (call changes); 2, Brighstone (Grandsire Triples); 3, Brading (call changes); 4, Ryde (Grandsire Triples); 5, Shanklin/Swanmore (call changes); 6, Under-30s scratch team (call changes). Following his deliberations Paul gave advice and suggestions to all teams as to how to improve but did say that 49 years ago when he moved to the Island and joined Ryde team there were no 8-bell teams of any note so was pleased to see that in our lifetime ringing on the Island had come so far as to be able to sport six teams for a competition, something that would have been unheard of, even 25 years ago! In giving the results he did say he had been harsh in his marking but hoped this would be to our advantage and help us with improving our ringing in general. The inexperienced teams were particularly to be congratulated on their sterling efforts. The final result was as follows: 1st, Ryde (48 faults); 2nd, Brighstone Grandsire team (86 faults); 3rd Brighstone call change team (114 faults); 4th, Brading (146 faults). Team 5 (Shanklin/Swanmore) were unfortunately unmarked as even with a gallant effort by all they didn’t complete the piece required. The Under-30s scratch team didn’t enter as competitors but to give their young team the experience of competition ringing, the youngest being just 7 years old in the last few days! With all the enthusiasm shown this afternoon this bodes well for Island ringing into the future. Tea and cakes were served by the Brighstone team so a big thank you to them for their hospitality. To Paul we also offer our thanks for an onerous job well done. Ryde tower captain, John Stock, receives the Don Exell Trophy from judge Paul Miller at the conclusion of the competition. Photo courtesy of Mary Tester. All Saints’ ringers at Ryde held their AGM this week and all officers remain in place for another year. We are still trying to persuade someone to take on the role of Deputy Tower Captain but I think yours truly is a bit of a hard taskmaster and no-one wants to follow in my wake! Officers are: Tower Captain, John Stock; Secretary, Joan Parry; Treasurer, Peter Taylor; Steeple Keepers, Revd Barry Downer and Kieran Downer. Revd Canon Graham Morris was also in attendance and thanked all the ringers for the work they do in letting the town know when things are happening… and this is a happening place!